Russia’s rusty aircraft carrier Admiral Kuznetsov has been back at her home port near Murmansk since February following a 2016 combat deployment off the Syrian coast. Kuznetsov took a beating from heavy use and what’s next is a long-awaited refit, of which we now have a few details. First of all, the Kuznetsov is not technically an aircraft carrier—according to the Russian Navy’s definition—but a clumsily-titled “heavy aircraft-carrying missile cruiser” owing to her 12 Granit anti-ship cruise missiles. The retrofit will replace these with Kalibr-NK land-attack missiles, substantially boosting range, and fitted inside universal vertical launchers also capable of firing P-800 Oniks anti-ship missiles, according to Tass. Russian warships have on several prior occasions fired Kalibr missiles at Syrian rebel and Islamic State targets in Syria. In addition, the Russian Navy wants to upgrade its sole aircraft carrier’s flight deck, replace the electrical systems and swap out “several worn-out boilers.” The extent of the work reads like it’s practically a rebuild. The question is whether Kuznetsov, which launched in 1985 as the Leonid Brezhnev, is still worth keeping around. Kuznetsov’s mission to Syria, the first time Russia has ever sent a carrier in combat, was not significant in strictly military terms. Russia can keep warplanes taking off far more regularly, and with more armaments, from its Syria land base at Khmeimim than from its carrier, which can only deploy for short periods of time compared to U.S. carriers, and which has a ski-jump ramp instead of catapults—which means Kuznetsov’s planes must sacrifice fuel or payload to get airborne. Two of the carrier’s planes, a MiG-29KR and an Su-33, crashed during the mission—the latter went into the sea after an arresting cable broke. Afterwards, it appeared Russia moved some of the carrier’s air wing to Khmeimim, an indication of a hazard on the carrier or other problems with maintaining flight operations. But Russia’s spending on Kuznetsov is not about strict military utility. It’s political and a matter of national pride. Important states have aircraft carriers, and since Russia is an important state, then it must have one, too. Russian Pres. 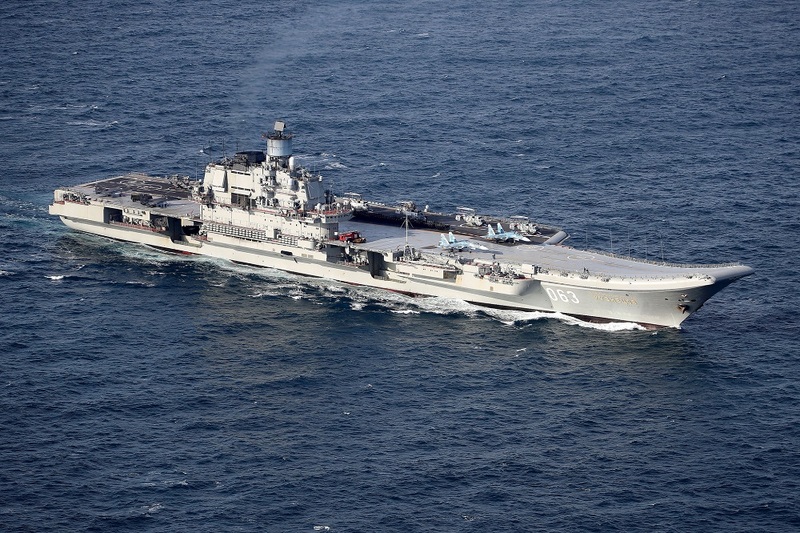 Vladimir Putin claimed the Kuznetsov’s voyage came from “his personal initiative.” Putin is well aware of the charged symbolism and global attention the combat deployment brought to Russia. By the time Kuznetsov finishes her refit, the Syrian war may very well be over, meaning she likely had a limited window to see combat. And the carrier is an economic engine. Kuznetsov’s modernization will take at least until the end of 2020 and cost around $713 million, according to TASS. Though a fraction of the cost of a new Gerald R. Ford-class carrier, it is a substantial investment and will keep the shipyard at Roslyakovo near Murmask busy. In any case, Russian aviators surely learned some valuable lessons from the Syrian deployment, and we will surely see a new and improved Kuznetsov at sea in a few years.